In a militaristic future Korea, a boy and girl meet. It is 2199, and Korea, China, and Japan no longer exist as separate countries but as members of the Neo Council (conveyed to readers in infodumps). Five decades of war have yielded many innovations, such as the God Machines (riffing on the tradition of Japanese mecha movies and Pacific Rim). Preparing to take his military placement exam before graduation from an elite academy, Jaewon is isolated: his father is dead, his mother abandoned him, and his former best friend has turned his back on Jaewon to gain power in one of the Old Seoul gangs. Jaewon’s military posting is to the Tower, the kilometer-tall building in Neo Seoul that serves as headquarters, where he is assigned to supervise Tera, a girl whose strength has been enhanced with drugs in order to pilot a new kind of God Machine. 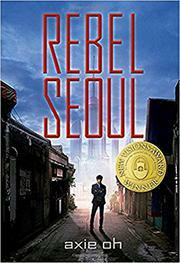 With war still raging and rebel nationalists seeking to make Korea an independent nation again, will two young people be able to find love in this plot-heavy story? While Jaewon is an effective character, much of the supporting cast is relatively flat and the dialogue occasionally stilted, which jars against the mostly colloquial flow.